As Sweet & Salty As Mom! Moms are like the perfect mix of sweet and salt! 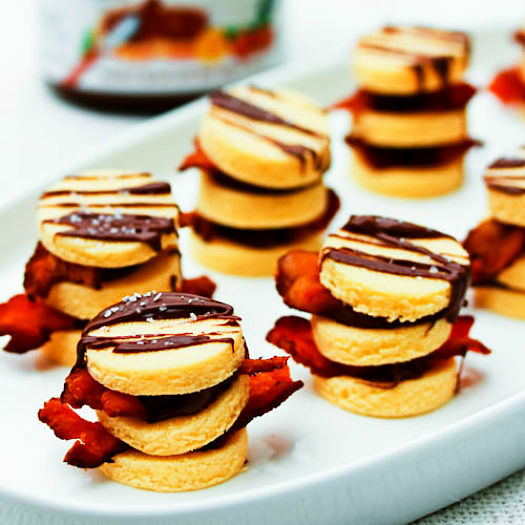 So why not celebrate her with a recipe that also blends a perfect balance of both: Bacon & Nutella Napoleons! This little creation is almost too easy to make. Dangerously easy!! It involves three stand-alone ingredients that when put together have a dark power~Bacon, Nutella, and Pound Cake. Sizzle up some strips of bacon and drain on a paper towel. Slice a pound cake into 1/4 inch slices. Then use a cookie cutter to cut small circles of cake. Place some Nutella in a piping bag (or plastic bag with the corner snipped off) and layer the pound cake, Nutella and b-strips. Drizzle a little extra Nutella on top and sprinkle with a touch of sea salt. Wiggly Worm Made It To The Royal Wedding!